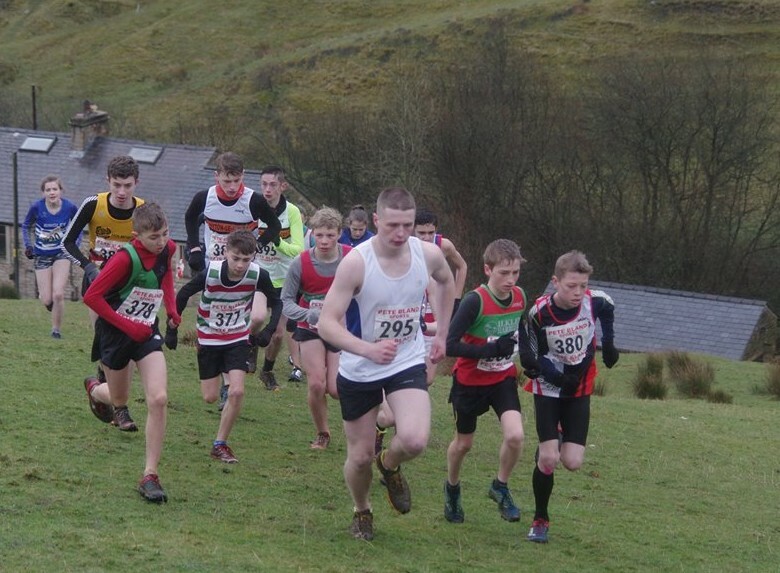 Senior Race – Saturday 6th April 2019 at 2.00 pm. Category AS. 4.5 miles / 1500 ft. Minimum age 16 years on race day. Entries £5 on the day. Registration at Barley Village Hall, near Burnley GR 822402 (BB12 9JU). Car parking available in the village car park with overflow along the road. Please park with respect to residents and car share if possible. Held under UKA rules and registered with the FRA. Please ensure that you have read the FRA requirements for Runners 2018. You will need to bring with you full FRA Mandatory Minimum Kit and a recommendation will be given on the day taking into account the weather conditions. Race numbers must be visible at all times and must only be worn on the chest. If after collecting your number you decide not to run, or retire during the race, you must inform registration in the village hall. Records: Men – R. Hope 31.24 (2018). Ladies – C. Rice 36.49 (2018). Results will first be published on ukresults.net. The results will subsequently be published on the FRA website, and also on the Clayton website. Results from previous years. No team prizes. As usual the village hall will have tea / coffee / cake available to purchase and Pete Bland Sports will have the van in Barley Car Park for any last minute essentials. The route is partially marked. A map is below. Entry £2 on the day. Registration is at the Village Hall from 11.00 am. 1 pm U15s and U17s (different turn back points for each age catgeory). The junior races take place on private farmland and it is lambing time. 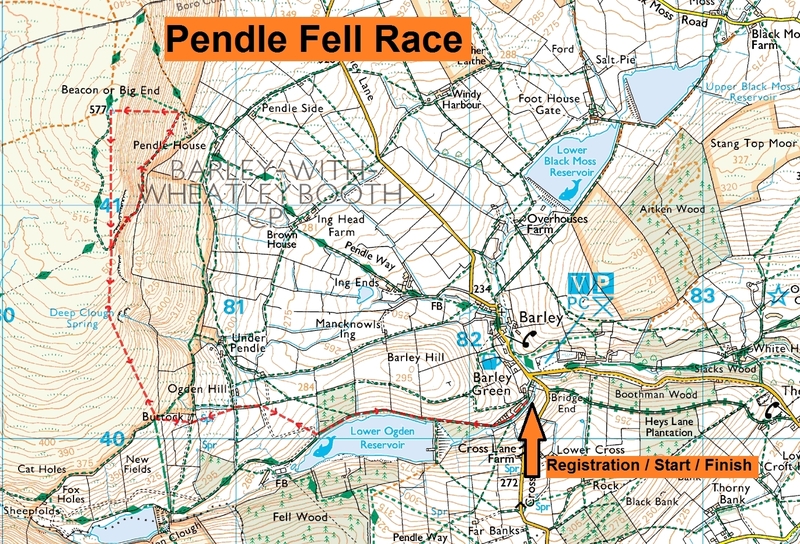 To ensure that the races can continue in future years please do not bring any dogs to the start / finish area, or the race routes as far as the stile shortly before the U13s turn point. The courses are all out and back from the field on the right just up the lane from the village hall. The terrain is track, field and fell. The route runs up to Buttock farm and then climbs towards the trig; each age category turns back at a designated point. Parents and guardians please make sure you have read the “FRA requirements for runners 2018”. Hot and cold refreshments are available in the village hall. Please car share where possible and park with courtesy and consideration for the residents of Barley. Contact details: Alan Dorrington 07717 543706. The routes are the same as last year. Pendle, ‘the Hill of the Lancashire Witches’ is the most prominent and best loved landmark in north east Lancashire and surrounding areas. The original race in 1956 was a 6.5 mile course with 1250ft of climbing and started from the Bay Horse at Roughlee. It was after the 1970 race on 4th April that a meeting was held at nearby Whitehough Camp School…………. and the Fell Runners Association was formed! The new course from Barley was introduced in 1974, with small changes made over the years on the lower fields to avoid a clash with farm animals during lambing season.